In October 1992, we bought a pumpkin. Now, I don’t remember every gourd-like squash I’ve ever purchased, but this one was special. It wasn’t the first pumpkin I’d ever bought, and it wasn’t the biggest. In fact there was nothing remarkable about it at all, except this: it was the first pumpkin that I ever bought as food. In the past, I had only procured pumpkins with the intention of carving faces into them. When I shopped for them, I looked for ones that were vaguely evil looking … sinister pumpkins, that looked like they would just as soon shoot me as look at me … soulless pumpkins that exuded quiet rage. That all changed one afternoon in 1992, when we happened upon a pile of pumpkins at our local vegetable shop. In that moment, it struck me that pumpkins were food too … and remarkably inexpensive food at that (important, as we were saving for our honeymoon). And, as I looked at one pumpkin in particular – a tantalizingly plump and inviting one – I realized that it could feed us for a week. We bought it, and embarked on what was to become a fun, week-long project: finding as many ways to eat our pumpkin as we could think of (this was in the olden days, and Mosaic was still a year in the future, so we had to rely on our own wits and knowledge). I still remember many of the things we ate that week: roasted pumpkin, pumpkin mash, roasted pumpkin seeds, spicy pumpkin stir fry, pumpkin soup (with a hint of maple and a dash of nutmeg), pumpkin pie and pumpkin quick bread. It fed us for a week, as predicted, and only the peel and stem ended up in the bin – something that felt like an accomplishment, somehow. Grease two loaf pans (we use glass ones). Mix the wet stuff and spices in a big bowl. Mix the dry stuff in another big bowl. Mix the dry stuff into the wet stuff. Fill the loaf pans ⅔ full. Bake for one hour, or until a wooden skewer or toothpick inserted into the bread comes out clean. Let cool for 5 minutes, then remove from pan and cool on rack. This entry was posted in Waste less recipes and tagged baking, bread, food waste, green, green living, moist, okara, pumpkin, pumpkin bread, quick bread, recipe, soy milk, soy pulp, sustainability, sustainable living, vegetarian, wasted food by Jean-François. Bookmark the permalink. very creative idea for okara! I wonder now if the pumpkins bred for jack-o-lanterns suffer on taste. If I buy any pumpkins, usually I get sugar pie pumpkins or kabocha. I skip the carving and just get right to roasting and eating! Nice how often food makes for great memories… We’re always looking for recipes to use okara and this looks delicious will definitely give it try, we just froze a bunch of fresh roasted sugar pumpkin purée the other day. Couldn’t agree more – there’s something about coming together to make something special that is hard to match, whether it’s over a camp fire or in a well appointed kitchen … with a big group of friends or family. Yeah! Another okara recipe! “Insanely moist” is what makes me drool over any gourd bread. I’ve been known to shred zucchini or pumpkin into many a muffin recipe for the same reason. We have 6 beautiful pumpkins awaiting a weekend carving session. I’ll be sure to save some flesh for your bread in addition to roasting the seeds — perhaps adding to an already long-lived fall tradition in our household! PSS — cushaw is doing great. I have four fruit set (two got mysteriously eaten by someone). We don’t squeeze the okara dry or roast it, so it’s basically the texture of mashed potatoes – and it made a real difference in the bread. It had a lot of body and was as far away from dry as a bread can be. Looking forward to hearing how yours turns out. PS Was sorry to hear of the demise & disappearance of your pumpkins. We’re just discovering okara since we bought our soy milk maker this summer. We’ve been doing a lot of experimenting with it, with varying levels of success. And yes, now is the time to stock up on all the bounty from the harvest. I just picked up a few butternut squashes myself, one of which is earmarked for dinner. Haha…loved your description of the type of pumpkins you looked for! :) This bread looks delicious, I’ll have to give it a try for sure! Thanks … if you give it a try, let me know how it goes. WONDERFUL recipe! We still haven’t “carved” our pumpkin. 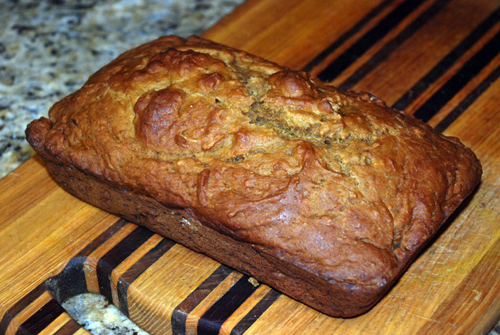 I was going to try to make an acutal pie this year out of it, but this pumpkin bread looks way too good to pass over. (I still search for the lopsided, sinister looking ones though.) Out of habit, I guess….! We actually used a perfectly spherical, amicable-looking sugar pie pumpkin to make this, though in general, I think sinister, asymmetrical veg is the way to go. Homely vegetables tend to scare off most shoppers, and end up rotting away through no fault of their own. It was. Bonnie Lee has a real knack for throwing things together and emerging with perfect breads and cakes. As far as I’m concerned, it’s magic.